Much of what is known about Patrick’s legendary life comes from the Confessio, a book he wrote during his last years. Born in Great Britain, probably in Scotland, to a well-to-do Christian family of Roman citizenship, Patrick was captured and enslaved at age 16 by Irish marauders. For the next six years, he worked as a herder in Ireland, turning to a deepening religious faith for comfort. Following the counsel of a voice he heard in a dream one night, he escaped and found passage on a ship to Britain, where he was eventually reunited with his family. Since that time, countless legends have grown up around Patrick. 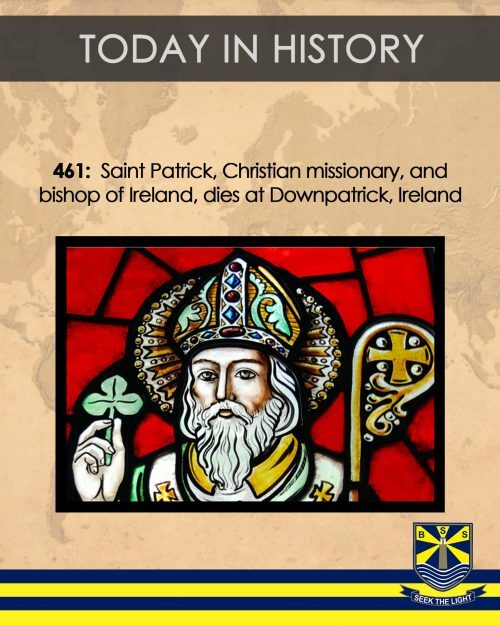 Made the patron saint of Ireland, he is said to have baptized hundreds of people on a single day, and to have used a three-leaf clover–the famous shamrock–to describe the Holy Trinity. In art, he is often portrayed trampling on snakes, in accordance with the belief that he drove those reptiles out of Ireland. For thousands of years, the Irish have observed the day of Saint Patrick’s death as a religious holiday, attending church in the morning and celebrating with food and drink in the afternoon. The first St. Patrick’s Day parade, though, took place not in Ireland, but the United States, when Irish soldiers serving in the English military marched through New York City in 1762. As the years went on, the parades became a show of unity and strength for persecuted Irish-American immigrants, and then a popular celebration of Irish-American heritage. The party went global in 1995, when the Irish government began a large-scale campaign to market St. Patrick’s Day as a way of driving tourism and showcasing Ireland’s many charms to the rest of the world. Today, March 17 is a day of international celebration, as millions of people around the globe put on their best green clothing to drink beer, watch parades and toast the luck of the Irish.